Most of us listen to music in some capacity and can say we like it. But there are the people who just listen casually to whatever happens to be on the radio, and then there are the people who spend hours carefully curating playlists, filling their calendars with concerts to attend, and even playing music themselves. This gift guide is for the latter group, who argue that they don't just like music, they love it. To fuel their passion, you can gift something that elevates the listening experience, teaches them something new about music, or puts them right in front of their favorite singer. 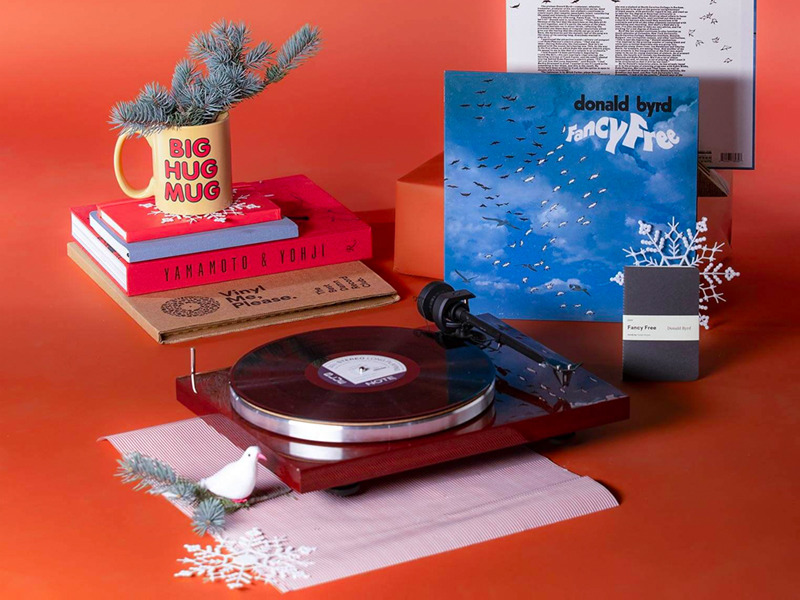 Shop these 17 gifts for music lovers below. Can they identify all the guitars held by famous rockers in this eye-catching print? They'll find the musical companions of Jimi Hendrix, Tom Petty, Kurt Cobain, and Joan Jett, among many other iconic musicians. This camera design is inspired by Taylor Swift's "Reputation" album and has the singer written all over it (literally — it features her autograph on both the back of the camera and the borders of the prints). The die-hard fan in your life can bring the portable camera to all their concerts to immortalize the experience. Vinyl record owners experience no greater joy than when they get to add to their collection and play a new record for the first time. Your recipient will choose from three different types of tracks each month and will also receive extra goodies in each package. The three-month membership includes one bonus record. Open this book and instead of finding the novel, they'll hear Hedwig's Theme play. It's an unexpected gift for a Potterhead that makes creative use of a material they're already very familiar with. A music lover wouldn't be caught dead without a pair of headphones, whether they're just running a quick errand across the street or settling into a long-haul flight. These Bowers & Wilkins ones not only bring out the best of each song and have three noise-cancelling modes, but also simply look great. Apple AirPods are far from perfect, but we have to admit they're really convenient. They're the easiest earbuds to pop into their ears since they're light and pair automatically with their phone, and they'll stay in surprisingly well. Singing along in the car or shower is fun, but singing along with the band live and in concert is another experience entirely. Hopefully they'll invite you to whichever concert they buy with this gift card. This sleek WiFi-enabled speaker, which integrates seamlessly into their living room or bedroom, recognizes and artistically displays the lyrics of the song as it plays (see how it works here). The sound quality is also top-notch, which isn't a surprise since the company behind it is part of an incubator run by the famous Abbey Road Studios. Unless you've been living under a rock, you've heard the work of film score composer Hans Zimmer. Through lessons on tempo, character themes, sound palettes, and more, the composer of over 150 movies including "Inception" and "The Lion King" shows students how he makes movie score magic. There are 12 twelve-sided dice in this set made to inspire and push musicians out of their comfort zone. Though there are the classic chord progressions to default to, it never hurts to try new things and challenge their improvisation skills. The loud and powerful UE Boom 2 delivers 360 degree sound and has a long battery life, perfect for outdoor hangouts and parties. They can even continue being DJ at the pool or beach because the speaker is waterproof. They'll be able to stream music from Amazon Music, Apple Music (coming soon), Spotify, Pandora, SiriusXM, and more, without even lifting a finger. The multi-talented device can still hear their other commands over the music since it has seven mics and noise cancellation. This fascinating book delves into why music is so important to us and is written by someone with a firm grasp on both the artistic and scientific sides of it: a neuroscientist who previously worked as a session musician, sound engineer, and record producer. Videos and photos aside, a way to remember their concerts, down to the exact seat in the venue, is this ticket stub diary. There's also space on each page to jot down notes and memories to look fondly back on later. These small accessories are the perfect finishing note on his ensemble, whether he's heading to work or the symphony.